This article explores recent advances in energy harvesting and power generators. The majority of modern energy harvesters consist of miniaturized power generators which take advantage of energy sources readily available in the ambient environment. Energy harvesters produce power without the use of outside sources. Energy harvesting has a long history which began in the 1700s with a self winding pocket watch which took advantage of the wearer’s movements. The first wristwatch to be powered by photovoltaic cells was developed in 1972. There are a variety of mechanical sources which can provide energy to be harvested.These sources include both steady and intermittent power. Flowing water is an example of a steady source of power, while a person's heel striking the ground is an example of intermittent power. Glucose fuel cells take advantage of the electrochemical reaction which occurs between glucose and oxygen in an anaerobic environment. These fuel cells can attach to surgically implanted medical devices in order to provide a steady source of power without the use of batteries. Electroactive polymers can also be used and create electricity when they are stretched or compressed. These types of compounds are ideal for applications where they are continually placed under compressive stresses such as the heel of a shoe. Placed in the heel of a shoe an electroactive polymer produces electricity each time the person's heel strikes the ground. Electromagnetic induction is another method of accomplishing energy harvesting by using magnets, a coil and a cantilever beam. This type of device is ideal for situations where vibration is present. Electrostatic generators can also be used to take advantage of vibration and turn this type of motion into energy. Most recently, nanogenerators have been developed to power nanodevices. Nanotechnology occurs on a scale which can only be seen with a microscope. The nanogenerator is ideal for a nanodevice since only a minute amount of power is necessary. Noise, which is actually another type of vibration, is also being explored for its potential to provide energy. The most established energy harvesting devices consist of piezoelectric materials which convert mechanical energy into electricity. These devices have been shown reliable but suffer from cracking due to the brittle nature of their components. This problem has been solved by electroactive polymers. The miniaturization of many devices ensures that energy harvesting is a field which will become more important. Energy harvesters are tiny power generators which take advantage of sources that are readily available in the ambient environment. These sources can be things such as wind, water flow, electromagnetic energy, temperature gradients, movement, chemical reactions, vibration, or sound. Energy harvesters use some of the same sources as larger scale power production like those for houses, transportation, spacecraft and other technologies which require standalone power sources due to their remote locations. However, energy harvesters are generally much smaller than traditional power plants. The typical energy harvester is only a few centimeters in size. 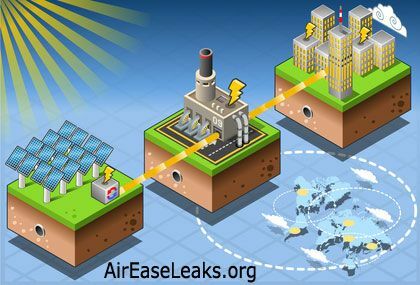 In relation to energy harvesting, the term "harvest" is being used to represent ambient energy sources which are available without requiring the use of resources not already being utilized. Energy harvesters are now needed due to the development of microelectronic devices which are difficult to wire for an outside energy source. Also, energy harvesters can be used to power items such as medically implanted devices which would be troublesome if they required battery replacement. The term energy harvester can be misused. For example, a miniaturized turbine within a pipe may work well for producing electricity but cause an unwanted pressure drop. The pressure is then increased at the pump station in order to compensate for the pressure drop. The pump station is provided by power from an outside source. Therefore, the miniature turbine is not a true energy harvester because it requires extra outside energy be used by the pump station. A true energy harvester uses sources which are already available without extra energy being applied. Energy harvesting has a long history. In fact, harvesting of energy began before the age of electricity when only mechanical means were available. An example is the self-winding pocket watch which was developed by Abraham-Louis Perrelet around 1770. This watch took advantage of the wearer's movements in order to generate energy for rewinding itself. This may be the first example of energy harvesting, but no such claims were made by the watch maker. The Atmos clock was developed in 1927 by the French engineer Jean-Leon Reutter. This clock took advantage of the natural change in temperature which occurs during the normal day and night cycle. The changes in temperature caused expansion or contraction within a gas filled capsule which wound the clock spring. In 1956 the American physicist Robert Adler developed a wireless remote control for television which converted the mechanical energy of pushing a button into an acoustic signal. This was marketed as "Zenith space command". The technology stayed in use until the 1970s. It should be noted that there was no battery in this remote controlled device and the pushing of the button merely created a sound like a tuning fork. Since no battery was necessary, some would consider this an early energy harvester. However, energy was exerted by the user who pressed the button. The age of electronics demanded that harvested energy be converted into electricity. A modern watch which uses harvest energy is still powered by electricity. Photovoltaic cells are now used to convert light into electricity. In 1972 the American inventor Roger Riel developed the first wristwatch which was powered by photovoltaic cells. This wristwatch was called the Synchronar. These types of photovoltaic cells are now common in wristwatches and calculators. There are many sources of mechanical energy which can be harvested. Sources of mechanical energy which provide a steady flow are based upon fluid dynamics. These sources include wind and water which is passing through natural channels or man-made areas. Most people are familiar with this type of technology on a large scale such as the power provided by hydroelectric plants. For example, Niagara Falls produces a tremendous amount of electrical power with its continually flowing water. Many countries also take advantage of large windmills to generate electricity. Due to recent advances in miniaturization the same concept can be applied on a much smaller scale to energy harvesting devices. For example, the blood flow or breathing in humans is now being considered a potential power source for implanted medical devices. There are also a variety of mechanical sources which provide intermittent power. Many times this power is provided in a cyclic way. An example of this type of energy harvesting device would be a unit which uses the energy of automobiles passing over it to move a metal plate up and down producing electricity. Another example is a device which takes advantage of the heel strike of a person as they are walking. A person who weighs 60 kg applies the force of at least 588 N to their foot for walking. On the average, this movement is associated with a 10 mm deflection of the shoe against the floor. If the person is walking at a rate of 2 steps per second there will be approximately 5.88 W per foot of energy generated. Eleven watts of power is enough to provide electricity for a variety of miniaturized devices. The larger number of surgically implanted devices which are now used in healthcare increases the demand for energy harvesting options within the human body. A particularly promising avenue of research in this area is glucose fuel cells. This type of technology involves a surgically implanted abiotically catalyzed glucose fuel cell producing small amounts of electricity to power medically implanted devices. The fuel cell takes advantage of the electrochemical reaction which occurs with oxygen and glucose. Both oxygen and glucose are readily abundant in human body fluids. Electrochemical reactions are facilitated by an abiotic catalyst such as platinum or activated carbon. Platinum will catalyze both electrode reactions. Therefore, the separation of the reactants is required. A cathode made of activated carbon is placed at the front of the anode. The carbon depletes the oxygen inside the fuel cell. Glucose oxidation then takes place due to the anoxic conditions. A glucose fuel cell using activated carbon to remove oxygen and facilitate glucose oxidation can be made which is no larger than 1.5 cm square. This size allows the miniaturized power plant to be mounted directly on the surface of medically implanted devices. This close proximity enables the fuel cell to be integrated more easily with the operation of the medical device. Early studies with the previously described glucose fuel cell have proved promising. After 40 days of operation in the laboratory, the glucose fuel cell produced 1.1 µW/cm2. The cell voltage was 218 mV. From day 40 to 50 there was no performance degradation in the fuel cell. After 32 days of operation the aeration was discontinued, which reduced the oxygen levels. This resulted in the expected increase in power due to more glucose oxidation within the anaerobic condition. It was previously mentioned that electrical energy could be generated by taking advantage of the energy created by a heel strike when a person is walking. This mechanical energy is converted to electricity through the use of electroactive polymers. SRI International did a research study for the United States Army to further investigate using electroactive polymers to convert heel strike to electricity. The United States Defense Advanced Research Project Agency wanted to know if energy produced by a soldier’s boot, while walking, could be converted to electricity in order to supplement battery power. This battery power could then be used for specialized boot functions such as inertia navigation or other mobility performance enhancers. The polymers investigated were electroactive so that when they were stretched or contracted they generated electrical impulses. It was determined that a variety of polymers, such as acrylic elastomers, were relatively powerful for generating electricity. Some of these compounds generated electricity as high as 0.4 J per gram. This type of energy is more than sufficient for the applications which the Department of Defense was interested in. For example, 0.8 J per step were obtained from the heel-strike generator. This was believed particularly important since the electroactive polymers used were more durable than the alternative ceramic piezoelectric units which were brittle. Another issue with using electroactive polymers to generate electricity is that the voltage created is too high for the microelectronic devices which need the power (R6). The power generator which uses heel strikes and electroactive polymers must contain electronics which step down the voltage. When the research was conducted in 2002, the technology was slightly too large to be placed in the heel of a boot. However, with the rate of miniaturization it is inevitable that this will be possible in the near future. Energy can be harvested by using electromagnetic induction. Electromagnetic induction occurs when voltage is generated in a conductor by changing the surrounding magnetic field. One way this changing magnetic field has been induced is by using magnets with a coil and resonating cantilever beam. In this type of apparatus a vibration can be used to move a cantilever beam with magnets attached. The magnets change the field surrounding a conductor and produce electricity. One advantage of this type of electrical generation is that the system can be enclosed and isolated from the surrounding environment. This provides for an expanded level of applications. Electromagnetic induction can be quite reliable since there is no physical contact between the magnets or the conductor. This means wear upon the conductor due to friction is nonexistent. Also, no separate voltage management is necessary in this type of arrangement. However, the magnets can be relatively large and bulky for use with devices which have limited space. Another way to harvest energy from electromagnetic sources is by using magnetostrictive compounds. These compounds are suitable for constructing actuators and sensors that convert mechanical energy into kinetic energy. The magnetostrictive compounds are flexible and work well in systems with high vibration. This is an advantage since many energy harvesting requirements are in high vibration settings. For example, a medical device may be located near the vocal cords which are intermittently vibrating when a person is speaking. This vibration can be converted to electrical energy used to recharge a battery in a surgically implanted medical device. Electrostatic energy harvesting is also called capacitive energy harvesting. This type of energy production takes advantage of capacitance in vibration-dependent varactors. These varactors are variable capacitors which consist of separate plates with an initial charge. Electricity is created when vibration causes electrostatic forces to develop between the plates. There are 3 basic types of electrostatic generators. Electrostatic generators include in-plane overlap, in-plane gap closing, and out-of-plane gap closing. One advantage of this type of energy harvesting device is that they are able to easily integrate with complex microelectronic devices. The major disadvantage of using this type of energy harvesting system is that they require outside energy to initially charge the capacitor. However, the outside energy can be provided by a battery which has been previously charged by the electrostatic generator making the system self-sustaining. There is demand in the defense sector and personal electronics industry for a self powered nanosystem which can harvest its own energy from the environment. Nanodevices require small amounts of energy in order to operate. There is the potential for thermal, solar, wind, friction, vibration, and body movements to provide more than enough energy to power a nanodevice. The type of energy source used depends upon the application for the nanodevice. For example, if a nanodevice is being used for military surveillance, it might be placed on a moving vehicle where vibration is an optimal supplier of energy. Another option would be to place the device near the front of the vehicle and use wind as a source of energy. A study by Qin, Wang & Wang investigated how nanogenerators could be developed which convert low frequencies, such as 10 Hz, into electricity. This type of technology is based upon soft materials which are flexible. The study used piezoelectric zinc oxide nanowires which were grown radially on textile fibers. The textile fibers brush against one another with the application of low frequencies. This causes their rooted nanowires to move against each other. This mechanical energy is converted to electricity through coupled piezoelectric-semiconductor processes. These textile fibers can be used to make fabrics which use very slight wind or body movements to produce electricity. The study by Qin, Wang & Wang used Kevlar 129 fibers which are ideal due to their strength and thermal stability. ZnO nanowires were grown radially onto the Kevlar fiber surface using a hydrothermal approach. Scanning electron microscopy of the Kevlar fibers revealed uniform coverage of the fiber which maintained a cylindrical shape. The nanowires were in the approximate range of 50 to 200 nm in diameter. They were typically 3.5 µm in length. The space between these nanowires was a few hundred nanometers which was large enough to allow generation of the piezoelectric potential. The experiment done by Qin, Wang & Wang was successful and a fabric was developed which was made with fibers composing a nanogenerator. The fabric displayed good performance over a variety of frequency ranges. Pulling the fiber resulted in electrical energy being produced. A variety of new technologies such as computers which are the size of a shirt button, micro sensors which are so small that they can be dispersed throughout a natural environment yet remain unseen, and medical devices which can be ingested are now being investigated. All of these new technologies have a need for reliable energy which can be provided within the natural environment. The harvesting of energy from noise is a viable option for many of these devices. Noise creates vibrations which can be converted to electricity. This conversion is based on oscillating mechanical instruments which convert kinetic energy through inductive or piezoelectric methods. These mechanical oscillators are usually designed to respond to the dominant frequency. These devices will only produce electricity when they receive noise within a certain frequency range. One disadvantage of this type of technology is that the mechanical oscillators are not producing electricity when noise with a different frequency range is present. Gammaitoni, Cottone, Neri & Vocca demonstrated that a bistable oscillator could be used to produce electricity over a wide range of frequencies. In fact, under certain conditions the performance for this nonlinear oscillator was superior to that of the traditional oscillator. These researchers took advantage of nonlinear stochastic dynamics to increase energy harvesting efficiency made by a piezoelectric inverted pendulum. One of the advantages of an energy harvesting system which can produce electricity over a range of frequencies is mobility. Energy harvesting systems which can only produce electricity when presented with noise from a certain range are likely to be most effective in certain locations. However, a system which can use noise from a variety of frequencies may be able to convert sounds into electricity in a variety of settings. A photovoltaic cell converts light energy into electrical energy. Frequently, this light is absorbed from the sun. However, artificial light can also be used. Many times a photovoltaic system is used when an inexpensive power supply is not available and natural light is prevalent. An example of this is well known to most motorists in the United States and many European countries. Portable roadway signs are often powered by photovoltaic cells since establishing the power connection to the temporary device would be inordinately costly. Also, some permanently mounted roadway signs which are quite large receive power in this manner to meet with new regulations on renewable energy. These systems are designed to take advantage of periods when light will be the most intense. The most widely used photovoltaic cells are silicone-based. These types of cells are more sensitive to light and are not overly expensive. Most systems using this type of energy take advantage of light being available for certain periods of time, while not available at others. The solution for most of the system consists of rechargeable batteries which save the extra energy produced by the system when a preponderance of light is available. At night, or on a cloudy day, the system can rely upon the batteries for power. A disadvantage of allowing the photovoltaic system to store energy in rechargeable batteries is lack of efficiency. At this time, there is a great deal of energy lost during this process. However, researchers and engineers are working to make this process more efficient. Piezoelectric materials have the ability to convert mechanical energy into electricity. This mechanical energy can be generated from vibrations or pressure applied to the material. These materials convert the mechanical load directly into an electrical charge. A variety of materials have been investigated by researchers and proved successful for use with energy harvesting devices. Piezoelectric materials have the ability to detect vibrations due to their naturally converting these energy sources into electricity. There are now a wide variety of piezoelectric materials which can be used for actuating, sensing, or harvesting energy. The choice of which material to use depends on the application. Some of these materials occur naturally, such as Quartz. Other piezoelectric materials such as polycrystalline ceramics are man-made. Recently, Lead Zirconate Titanate has been researched due to its excellent efficiency for converting mechanical forces to electrical energy. The anisotropic characteristics of piezoelectric materials provide a difference in properties depending on the direction of forces applied and orientation of the electrodes used. When piezoelectric materials are used to harvest energy there must often be a means of using the excess energy. Methods of making efficient use of this extra energy consist of circuits which transfer the energy for additional use, or batteries which can be recharged by the excess energy. Common capacitors are not acceptable for this purpose due to their quick discharge. An example of early work done with piezoelectric material for producing electricity consisted of dropping a ball bearing on to a piezoelectric transducer. When the ball was dropped it struck the transducer which then produced an electric current. This energy was then stored in a battery. This simple type of experiment led to more useful studies resulting in energy harvesting devices. An example of an energy harvesting device making use of piezoelectric materials is provided by researchers who placed a film of piezoelectric material on a steel beam. When the beam resonates under pressure, the piezoelectric material produces electricity. This type of energy harvesting device can be used on bridges for automobiles or train tracks. Each time a vehicle passes over the beam, electricity is generated. This electricity can then be used for signs or signaling devices which are near the area of transportation. Another way in which piezoelectric material can be used to harvest electricity involves human activity. Piezoelectric materials such as polyvinylidene fluoride have been placed in the heel of a shoe. When a person walks, the heel of the shoe strikes the ground producing mechanical energy. The polyvinylidene fluoride then converts this mechanical energy into electricity. This type of device has a variety of uses commercially such as running shoes with lights for safer nighttime jogging. The military can also use this type of technology for many different applications. For example, piezoelectric energy harvesting devices can be placed in a soldier’s boots in order to power small transmitters which allow the soldier’s location to be recorded. One advantage of piezoelectric materials over other types of energy harvesting devices is their ability to generate power of the desired voltage without the need for additional equipment to step up or step down the current. Many of these types of piezoelectric materials are compatible with surgically implanted medical devices. One of the major disadvantages of piezoelectric materials is that they are brittle and can leak their charge if cracks develop. This makes piezoelectric material inappropriate for applications where it will be subjected to forces which stretch or compress the material. Thermoelectric generators create electricity from a temperature gradient. For example, the temperature difference between air and soil can be used by the pump in order to generate electrical power. Heat pumps which use this temperature gradient generally produce more power than similar piezoelectric devices. Thermoelectric generators which are solid-state generally have a longer life, higher reliability and lower maintenance. The solid-state thermoelectric generators have limited use due to their high cost and low energy production possibilities. However, a great deal of research is being done at this time to produce solid-state thermoelectric generators using materials which overcome these disadvantages and increase the productivity of these devices. Traditionally these types of energy harvesting devices have been used in high temperature applications such as industrial furnaces. However, recent studies show that the technology is equally effective for a similar temperature gradient at lower temperatures. It is the temperature difference which is important in determining how much electrical energy can be generated from this type of system. Vibration is a potential source of energy harvesting available in a wide variety of settings. The amounts of energy which can be obtained from vibration depends upon both the frequency of the vibration and its amplitude. The amount of energy harvested from vibration also depends on how the energy harvesting device influences the vibration. The energy harvesting device must have a relatively small mass compared to the vibrating structure in order to not adversely affect the level of vibration. Both the amplitude and frequency of vibration from potential sources of energy harvesting vary widely depending upon the application. For example, a car engine may vibrate at 200 Hz while the floor of an office building may vibrate at 100 Hz. However, the majority of vibration sources have fundamental frequencies between 60 and 200 Hz. It should be remembered that most environments do not provide a single vibrational frequency. Most vibration sources provide a range of fundamental frequencies with the associated harmonics. An example of this can be seen with a domestic freezer. Most domestic freezers have a fundamental frequency of around 50 Hz with acceleration amplitude of 0.1 m/s -2. The second and higher harmonics are found at considerably lower amplitude levels. Unfortunately, most energy harvesting devices have a narrow range of operating frequencies. For this reason, it is important that the nature of the vibrating source be thoroughly understood before an energy harvesting device is placed on it. The energy harvesting device can be effective using either the fundamental frequency or one of the harmonics. There is also the option of placing more than one energy harvesting device on a structure in order to gain energy from both the fundamental frequency and the harmonics. Recent advances in miniaturization have created a demand for energy harvesting which can supply tiny devices with energy from the ambient environment. A number of sources are present in most environments including movement, wind, flowing fluids, electromagnetic energy, temperature gradients, vibration and mechanical energy. Energy harvesters take advantage of these potential forms of power without using external sources. By providing standalone, portable power to small devices energy harvesting allows for the practical use of miniaturized devices. Advances in medicine have provided a number of miniaturized devices which are surgically implanted within the human body. These devices require power like any other mechanical or electronic device. Energy harvesting offers a nonintrusive way of powering such devices. Batteries are not practical for many of these units due to the need for the patient to undergo surgery in order for the battery to be replaced. A number of solutions have been provided to power surgically implanted medical machines. Glucose fuel cells take advantage of the electrochemical reaction between glucose and oxygen. These chemical power plants use activated carbon within a fuel cell to remove oxygen. The anaerobic environment then allows a catalyst such as platinum to catalyze the reaction of glucose oxidation. This electrochemical reaction can then be converted into power for the implanted medical device. As technology advances and more items become miniaturized, the demand for energy harvesting devices will increase. Technical problems such as those created by brittle ceramic based piezoelectric plates cracking will be solved through advances in technology. For example, the problem of plates cracking was solved by the use of electroactive polymers which take advantage of the forces which created the cracks. This can be seen as the essence of energy harvesting. Energy harvesting consists of turning otherwise useless, or even problematic, aspects of the environment into useful forms of energy. Energy harvesting will inevitably become a more important part of our everyday lives. Chalasani, S. & Conrad, J.M., A survey of energy harvesting sources for embedded systems. Southeastcon, Illinois, USA. IEEE. Gammaitoni, L., Cottone, F., Neri, I. & Vocca, H., Noise harvesting. IEEE Sensors Conference, Chicago, IL. Gilbert, J.M. & Balouchi, F., "Comparison of energy harvesting systems for wireless sensor networks", International Journal of Automation and Computing, vol. 5, no. 4, pp. 334-347. Kerzenmacher, S., Sumbharaju, R., Ducree, J., Zengerle, R. & von Stetten, F., A surface mountable glucose fuel cell for medical implants. The 14th International Conference on Solid-State Sensors, Actuators and Microsystems Lyon, France. Leonov, V. & Vullers, R.J., Wearable electronics self-powered by using human body heat: The state of the art and the perspective. Journal of Renewable and Sustainable Energy, 1(6). Pelrine, R.E., Heel-strike generator using electrorestrictive polymers. SRI International, final report for United States Army Research Office government contract number DAAG55-98-K-0001. Qin, Y., Wang, X. & Wang, Z.L., "Microfiber-nanowire hybrid structure for energy scavenging", Nature, vol. 451, no. 14, pp. 809-813.